If luxury is your primary goal, the Saatva mattress is a surprisingly affordable option. It’s a hybrid memory foam plus coil mattress with specialized lumbar support for a restful and supportive sleep. Varying firmness levels allow for customization, but the main attraction is the 14.5-inch thick luxury mattress. But in addition to the thicker mattress option, Saatva also offers the choice of a thinner mattress (11.5 inches) that works with adjustable bases. 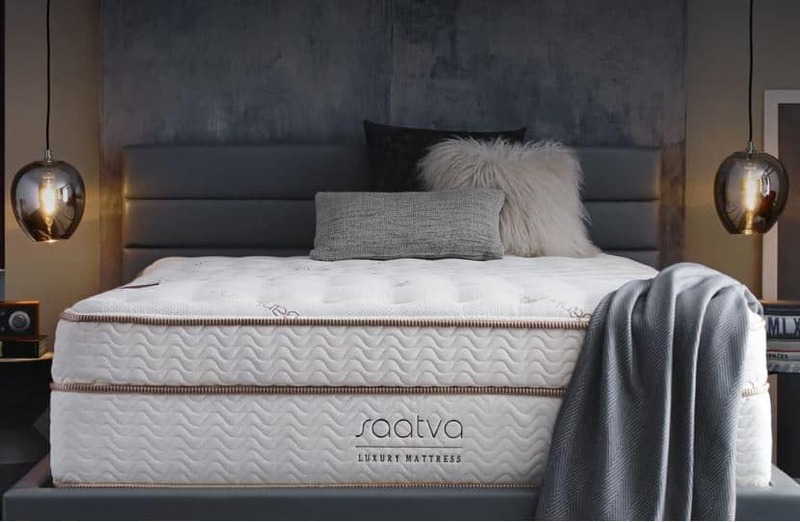 This allows customers another level of customization, as a Saatva mattress paired with their adjustable base offers both comfort and convenience. Most customers choose the Luxury Firm level mattress, but if it turns out not to be the right fit, the company maintains a 120-night trial after which they’ll refund the purchase price of the mattress, minus a $99 transportation cost. What is a Saatva Mattress? 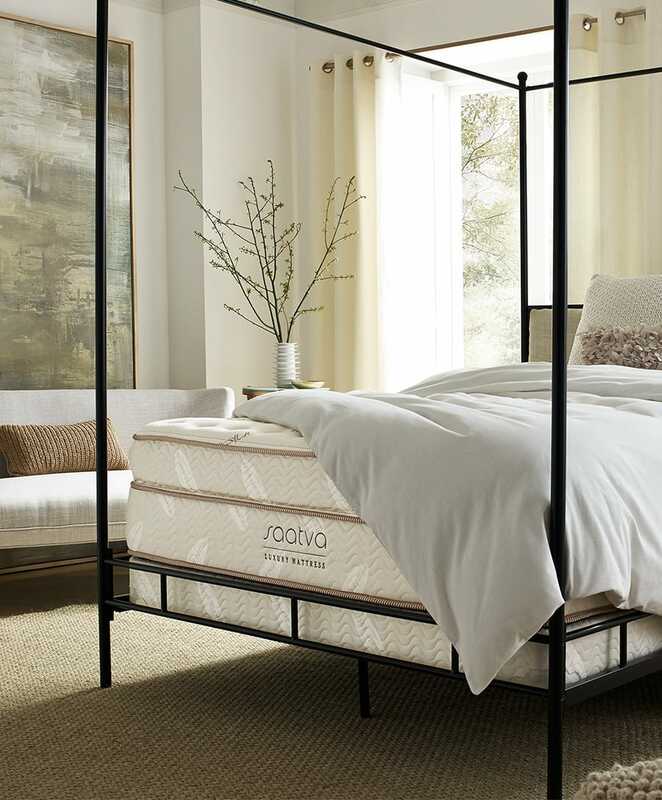 Saatva mattresses aim to deliver luxury-level comfort in each of their mattresses—albeit at a reasonable price point. The company compares its mattresses to Stearns & Foster Reserve No. 3 Luxury Firm Euro Pillow Top Mattresses, a bed that comes in at double the cost of the Saatva option. Other comparable beds include Simmons BeautyRest Black Desiree, Serta iSeries, Alreloom Reserve Arlington, and Kingsdown Sleep to Live. But just because it costs substantially less than those big-name brands doesn’t mean Saatva skimps when it comes to features and materials. Many of their components are organic—such as the cotton cover—but they also utilize recycled steel, CertiPUR-US foam, and Guardin botanical antimicrobial fabric treatment for eco-friendliness. Plus, the company focuses on reducing its carbon footprint while ensuring consumers can skip the costs that come with purchasing a mattress in a retail store. Calling its beds “eco chic luxury,” Saatva promises low-allergen materials, "green" flame retardant use, and little to no odors from the mattress upon arrival. What Are the Parts of a Saatva Mattress? Saatva makes all its mattresses in the United States and Canada to established eco-friendly specifications. Nineteen factories and over 100 fulfillment centers handle assembly and distribution of the beds. Here is more about each component of the Saatva mattresses. The Saatva mattress features a plush organic cotton cover and euro pillow top. A euro pillow top provides more cushion and comfort than a standard pillow top. 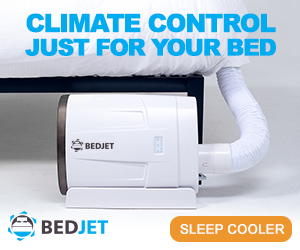 The outer cover keeps everything tucked in and offers a plush sleep surface. Also inside the outer layer is Guardin botanical antimicrobial fabric treatment, which not only inhibits bacteria growth but also prolongs the life of the organic cotton cover. Although the Saatva is a hybrid mattress, the company concentrates on high-quality foams in its construction. The top layer of foam functions as lumbar support with a pressure-reducing surface that alleviates tension in the lower back. Underneath the memory foam layer is a layer of individually wrapped comfort coils. The coils are what makes the Saatva a hybrid; the tempered and oven-baked coils are each individually wrapped, preventing those uncomfortable ‘spring’ pokes and any future sagging. With their responsiveness and tight wrapping, the coils help respond to each sleeper’s body weight and contour to their shape. Contouring reduces pressure points and allows consumers to achieve a more comfortable and restful night’s sleep. The coils help promote spinal health by keeping pressure off sensitive areas while contouring to your body. Also, Saatva notes that innerspring construction means higher breathability. Because there is airflow between the springs, this deters dust mites and germs from settling in. While many traditional innerspring coil mattresses tend to sag over time, Saatva has a solution for that. Not only are its coils individually wrapped for integrity, but there is also dual perimeter edge support to keep the edge of the mattress from sagging. The foam-encased edge support ensures stability even at the edge of the bed, helping preserve the mattress’ performance and comfort over time. Underneath it all, the Saatva mattress receives support via a tempered steel support lower coil base. The base helps promote the durability of the mattress overall and reduces the odds of sagging. All told, these layers help create a responsive and comfortable sleep surface that resists wear and tear. Three firmness levels are available for the Saatva mattress, whether you choose the 14.5-inch luxury or 11.5-inch adjustable base compatible model. Plush Soft ranks about a three on Saatva’s softness scale (one being a fluffy cloud and 10 being a diamond). The Plush Soft bed gives a body-hugging feel and provides an overlay of soft foam on the top of the mattress. The company notes that this plushness is often ideal for people who are lighter weight, those who are side sleepers, and people who simply prefer a plushier, soft sleep surface. According to Saatva, its Luxury Firm option is the most popular, with 82 percent of customers selecting the firmness. Falling between five and seven on Saatva’s plushness scale, the Luxury Firm bed combines cushioning foam and plenty of support for a responsive yet sturdy sleep surface. The Luxury Firm option is suitable for couples, all sleep positions, and anyone who needs spinal support and alignment. Saatva’s Firm bed ranks as an eight on their hardness scale, but that doesn’t mean it’s uncomfortable. The bed is ideal for back or stomach sleepers, those customers who are heavier, or those with specific medical conditions that benefit from a firmer sleep option. With more rigid responsiveness balanced with supportive surface foam, the Firm bed can be a therapeutic sleep scenario for many consumers. With the Saatva bed, motion isolation will vary simply because of the firmness options available. Most people desire high motion isolation to ensure they won’t feel when their partner moves or shifts during the night. For light sleepers, motion isolation can make the difference between a good night’s rest and a sleepless existence that only makes life more difficult. The Firm mattress offers the best motion isolation as there’s less to jostle about, but the Luxury Firm option is also stable. The least resistant and therefore most likely to jostle mattress option is the Plush Soft. Because of the nature of the top layer of memory foam, consumers can expect everyone who gets in the bed to sink into it, thereby affecting other occupants. Saatva does not use gels or other materials for cooling, but their organic cover is breathable to encourage a cool night’s rest. Breathable, high-quality foam ensures you won’t overheat, and contouring comfort coils maintain the bed’s shape will cradling your body. Further, the coil construction helps enhance airflow throughout the mattress, evaporating any wetness and helping keep sleepers cool. Saatva uses a natural thistle barrier to form a flame-retardant barrier. With a combination of wood pulp and polyester, the barrier requires no harmful chemicals or sprays. Saatva is passionate about eco-friendly materials and has never received a complaint about an allergic response to their beds. Where Can I Try a Saatva Mattress? Currently, the only way to try out a Saatva mattress is by placing an order and taking advantage of the 120-night in-home trial. As one of the best online mattresses available, Saatva practically guarantees your satisfaction post-trial. After you order, a delivery team will arrive and set up your new bed. From the date of delivery, you have 120 nights to enjoy the bed risk-free. 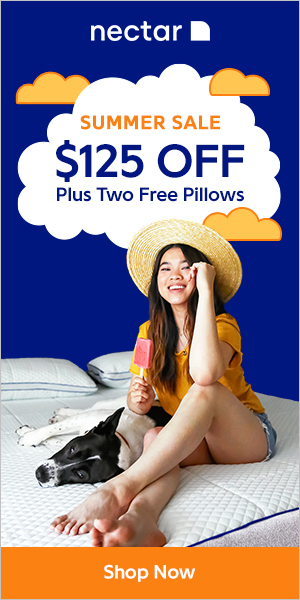 At the end of the trial, you can either keep the mattress or return it for a full refund (minus the $99 transportation fee for the company to come to retrieve it). The company does not restock mattresses and therefore guarantees every purchase is a brand-new mattress made to order. The company also notes that it sees very few returns, which is reassuring, particularly when shopping online. As many Saatva mattress reviews state, the company has an extensive trial period and a great replacement policy. Of course, the majority of Saatva mattress reviews highlight customers’ approval of both the ordering and delivery process plus the quality and comfort of their new beds. That said, here’s more on the trial period with Saatva and the warranty coverage customers can expect. Saatva’s trial period lasts 120 days with no penalties should you decide to return the bed. However, there is a transportation cost ($99) taken from your refund should you choose to send it back. The return policy does not apply to the company’s Lineal adjustable bases, however, though it does cover all types of mattresses. Once you have settled on the ideal mattress from Saatva’s line, the bed has a 15-year warranty to protect against defects. For the first two years of the warranty, you can receive a free replacement bed at no charge if your original mattress has a manufacturer defect. For years three through 15, the company will completely repair and re-cover your mattress. The same $99 transportation fee applies, but the rest of the service is free. Also, the Fairness Replacement Option means you can keep the original mattress while also receiving a ‘replacement’ at a percentage off the original price. For example, in years three through five of the warranty, you can request a replacement for a defective mattress and will only pay 30 percent of the original cost of the bed. The Lineal adjustable base comes with its own warranty; the warranty covers all parts and labor on the mattress for the first five years. After that, any repairs are based off a prorated cost structure. Not only does the in-home trial span 120 days, but you can also swap out the bed if you’re unhappy with the height, firmness, or size. To swap out the mattress, just pay the $99 transportation fee and get the bed that is the best fit. Saatva mattresses are available on their own, as a set (with a base), and as an adjustable set (with the adjustable Lineal base. Pricing is the same regardless of mattress firmness or height. When ordering, you will select a mattress size, a firmness level, and a mattress height before checking out. Below is pricing for the mattress cost alone. All mattress purchases include free white glove delivery throughout the United States. Delivery teams will set up your bed, including any frame, plus remove the old one for free. Saatva’s customer commitment goes further than most companies. In addition to free shipping, with delivery straight to your door, white glove service is also standard. The company’s delivery team will reach out to you the day before your mattress’ scheduled arrival date to decide on a four-hour delivery window. On the day of arrival, you can expect the team to arrive within the scheduled timeframe, unbox and set up your bed and frame, as applicable, and remove your old mattress. The team will even wait up to 20 minutes for you if you happen to be away from home when they arrive. If you miss the delivery window entirely, Saatva will contact you to reschedule an alternate delivery window. Saatva is one of the best online mattresses in the luxury category at an affordable price point. By keeping their product out of stores and offering mattresses online only, Saatva cuts down on costs and can focus on creating the most eco-friendly and luxurious bed out there. If the standard Saatva mattress doesn't suit your needs, try Loom and Leaf, another Saatva-made mattress! The Saatva attention to eco-friendly details, such as the antimicrobial and flame-retardant components, combined with the sturdy and supportive hybrid mattress model means a comfortable sleep experience for consumers.